The Shetland is the smallest of the British breeds. Rams weigh 90 to 125 pounds and ewesweigh 75 to 100 pounds. Although small and relatively slow growing, they maintain natural hardiness, thriftiness, easy lambing, adaptability and longevity. Shetlands are docile, easy to manage, and typically quite tame. People are often surprised to meet a sheep that will wag its tail when petted. Rams usually have beautiful spiral horns, whereas the ewes are typically polled. They are fine-boned and their naturally short, fluke-shaped tails do not require docking. The natural color and high quality isimportant to the wool industry of the ShetlandIslands, where natural wools are often used un-dyed. Shetland wool known for being soft and downy. Extra fine Ring Shawls are knitted, so called because the finest can be passed through a wedding ring. The wool is prized by handspinners. 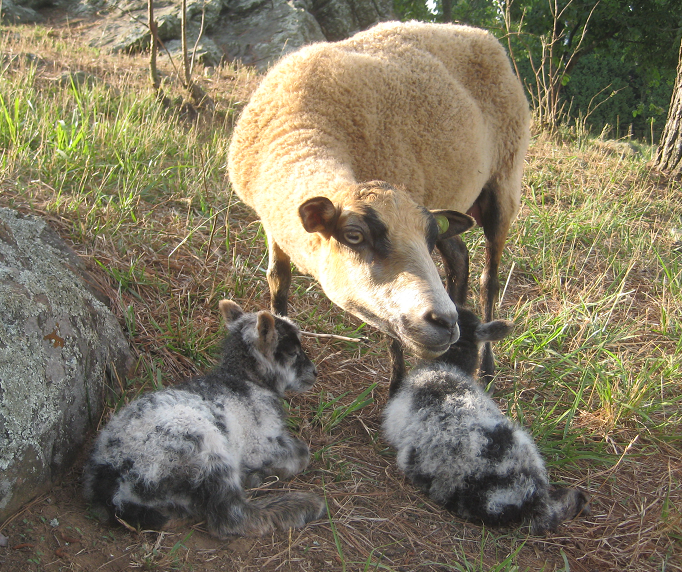 Shetland comes in one of the widest ranges of colors of any breed. Besides white, the breed produce many shades of wool including moorit (red/brown), shaela (silvery grey), fawn, grey, dark brown and black. There are 11 main colors as well as 30 markings, many still bearing their Shetland dialect names. This photo shows a detail of a sweater made from our Shetland wool, using different naturally colored fleeces from three different sheep in the flock .